Your wardrobe is going to need a few cozy dress options as the weather cools down, so now is the best time to rack up! The Shop With Us team has found a gorgeous contender at Nordstrom that will keep you warm, while still offering a pretty pop of color. Shop With Us: The Faux Suede Leggings That Look Just Like Trousers Are Now Available in More Colors! This Karen Kane Color Block Knit A-Line Dress is a design you can wear everywhere from the office to casual hangout sessions with friends. Shop it here: Get the Karen Kane Color Block Knit A-Line Dress for $98 while all sizes are still in stock! The upper red portion will help you brighten up your wardrobe, while the cowl neck collar operates almost like a scarf for an extra warm layer. A loose silhouette and soft, stretchy fabric blend make the frock a comfortable choice. Sizes range from XS to XL. Pair the color block design with over-the-knee boots for an easy, yet chic ensemble. 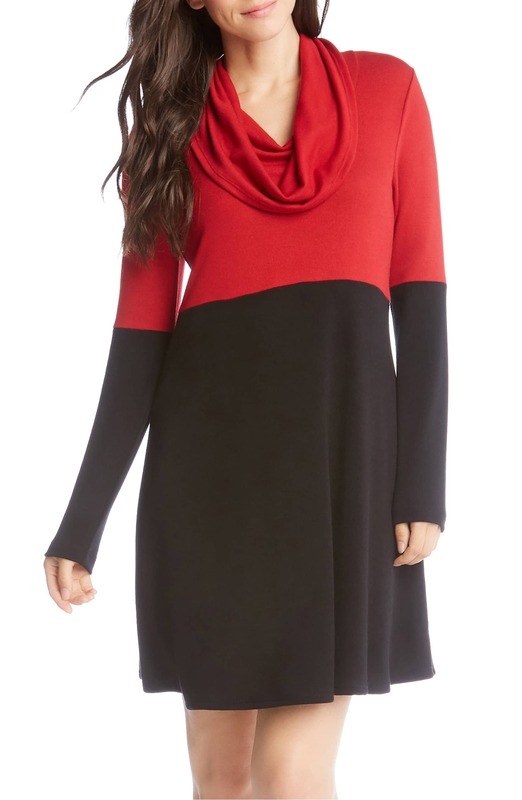 See it: Get the Karen Kane Color Block Knit A-Line Dress for $98 while all sizes are still in stock!